A happy new year to you, and this month brings us to some monumental diary dates. My birthday, our second service user involvement conference, and the launch of our website. Talk about excitement. all ears to hear service user experiences from every perspective. A special issue of DDN after the event will give us chance to highlight the issues that matter to you and pass on the big questions of the day to those who need to provide answers. Look forward to seeing you on the 29th – and if you can’t make it, we’ll report back in DDN and on the new website. It’s been a new game for us playing with so many elements of the site, so you have to humour us a bit while we’re still building up the content. There’s a ‘your space’ bit, where you can create your own page – great fun, particularly when your colleague posts you in the gallery as Wonder Woman. (Thanks Faye, I came out of that better than Ian.) 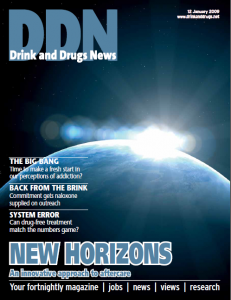 There are plenty of serious reasons for doing the site – not least our well organised archive of DDN back issues – and we’ve taken the plunge with a forum, giving scope for discussion on anything you want. Thank you to our first brave topic posters, you have been appreciated! Back to the mag and there’s new thinking for the new year in this issue. Cathy Dixon offers a different approach to aftercare in our cover story, while Fran Miller challenges the way we look at addiction on page 14. Don’t let me hold you up any longer! © Drink and Drugs News, all rights reserved.